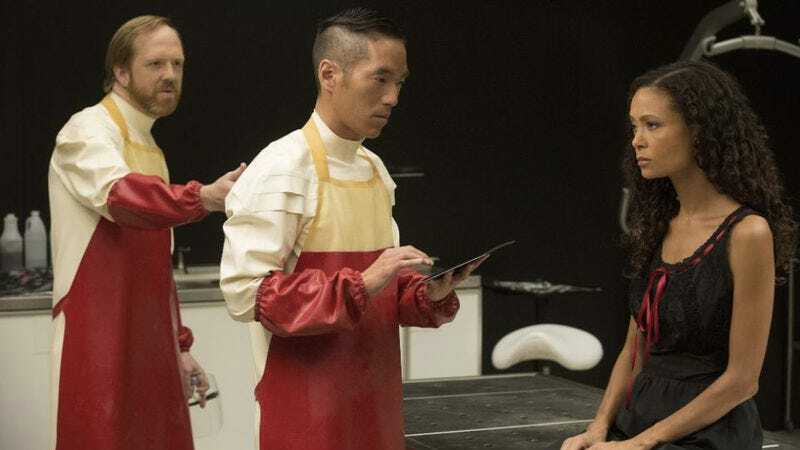 This weekend, Westworld showrunners Lisa Joy and Jonathan Nolan stopped by PaleyFest in Los Angeles to talk about the future of their HBO series, and they even took the opportunity to clarify a plot point from the end of season one. This comes from The Hollywood Reporter, which says the pair was largely “tight-lipped” about specifics for season two, but they explained that Thandie Newton’s storyline from last season—which ended with her choosing not to escape Westworld so she could stay behind and find her daughter—was specifically a decision that she made completely on her own. Apparently, people on the internet have been theorizing that her robot programming was simply kicking back in to prevent her from leaving, but Nolan and Joy said that is not the case. Also, nobody involved is offering any more information on the “Samurai World” park that was teased in the series finale, with star Ed Harris specifically saying, “I just don’t want to be naked and I don’t want to wear a samurai suit.” Meanwhile, Nolan simply said it “would be cool” to visit alternate robot parks like Samurai World, but he didn’t say if it would happen or not. As for things that we definitely know what happen in season two, Nolan and Joy announced that they have a new system in place to avoid anything like that big production delay that caused a several-month hiatus before the premiere of season one. Going forward, they’re going to write every episode of a season before they begin production on any of them, which will presumably give them a chance to sketch out every twist and turn well in advance. It’s not the most exciting tease they could’ve made, but at least we know season two of Westworld will actually premiere when they say it’s going to premiere—which, unfortunately, is still not until 2018.